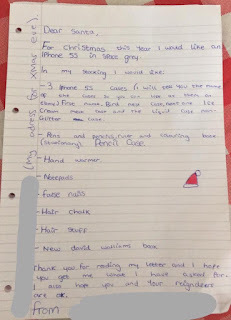 Mum of Five Staying Sane: My youngest children wrote their Christmas lists for Father Christmas. 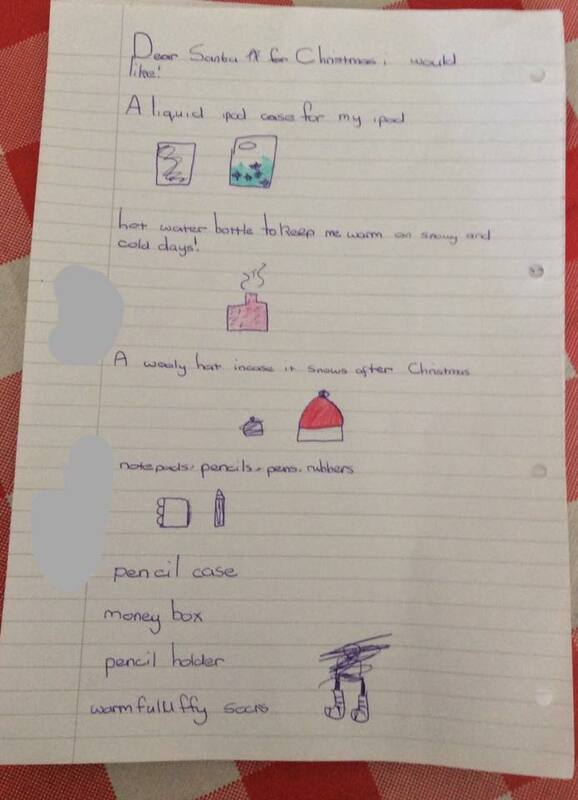 I am amazed at the difference in the understanding of what is a feasible present and which children clearly are just asking Father Christmas for far too much. Anyone for a pickled onion?! 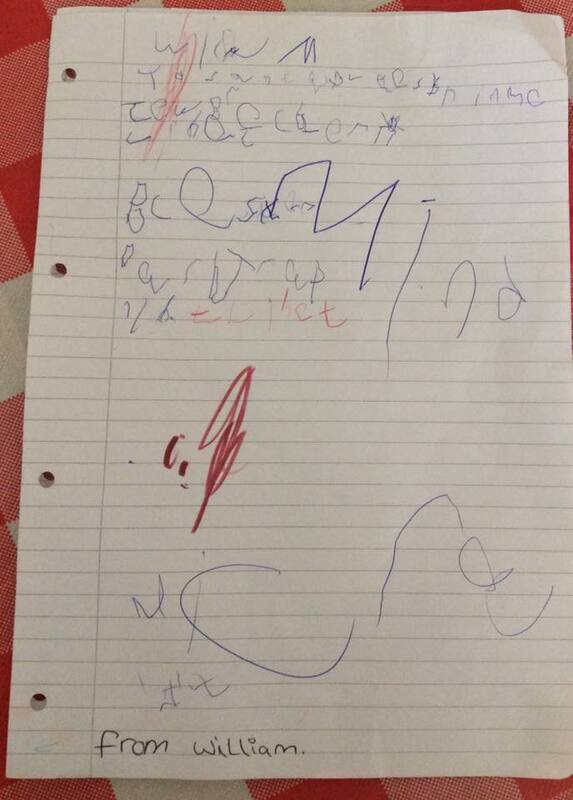 My youngest children wrote their Christmas lists for Father Christmas. I am amazed at the difference in the understanding of what is a feasible present and which children clearly are just asking Father Christmas for far too much. Anyone for a pickled onion?! So it's that time of year. I like to try and think that I am organised so I got the Thing's to write their Christmas lists for 'Santa'. The OH declared that it was far too early for them to be writing their letters but that's easily said when your not the one having to buy it all! So they sat at the table and wrote out their lists. I left them to it, had no involvement in what was being written down, made no judgement on what they had written until they had finished. 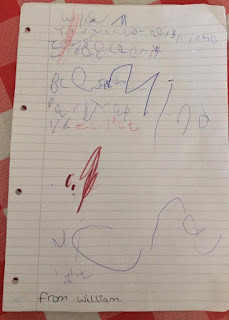 Thing 4 took it as a spelling test and tried his best to spell out everything that he wanted but clearly didn't think Santa would mind that his handwriting was all over the place!. 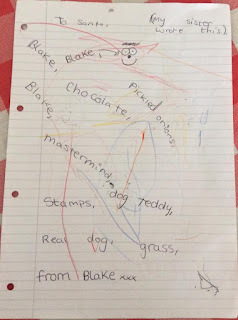 Thing 5 scribbled happily across the paper and then told his older sister what it was that he wanted and she wrote on his list too. Thing 4 wants everything Lego, Star Wars and Skylanders. He knew exactly what was going on his list. A green lightsaber that lights up and makes sounds, a Skylanders dark trap and some Skylanders figures for his PS4 game and Lego. Any Lego, preferably Star Wars or Minecraft but any will do. Thing 5 was slightly more demanding and possibly going to be disappointed with the lack of a puppy on Christmas Day! Santa no doubt can supply the dog teddy and chocolate. I loved the pickled onions on his list! I am so going to make sure Santa puts some in their for him. Thing 5 loves pickled onions, we can't disappoint him at Christmas. Thing 2 however, well, let's just say she may be disappointed this year! First on her list was an iPhone. Last Christmas she got a new phone. She asked for ages for this particular phone, spent most of Xmas day trying to make it work and she's not stopped using it since. However, she dropped it after about 2 weeks and although it still works perfectly 10 months on I'm still not overly keen on buying her something she can break 2 weeks later. On top of the iPhone request was 3 cases for said phone. No not one, that would be silly to ask for one case wouldn't it? I mean what kind of phone would you have if it stepped out in the same case each day?! 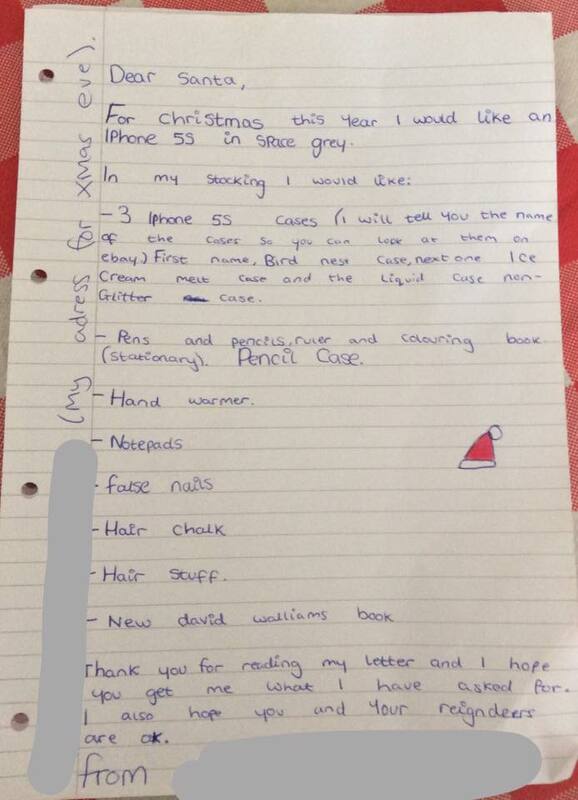 I do love how detailed she was in her descriptions so 'Santa' can look on eBay for the phone cases. Do elves not make anything nowadays?! On top of those requests her list continues but with more reasonably priced gifts. Stationery again from Thing 2. The 2 girls love stationery and always need it for school so 'Santa' is always happy to try and find lots of funky new pens, pencils, pencil cases, note books etc... to put in their stockings. I am also pleased to see the stationery Advent calendar is back in Smuggle this year so may let them both have one of those too. 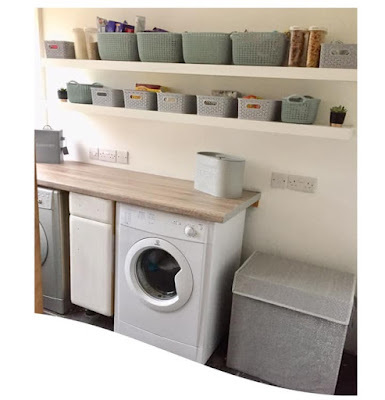 I will be truthful and say that this is the first time I have sat them down and asked them to write their lists, usually I will just ask them every now and again what they would like as I need to let Santa know. I'm glad that they all sat down and wrote them out, I've kept them so I can send them off as they requested me to do asap! 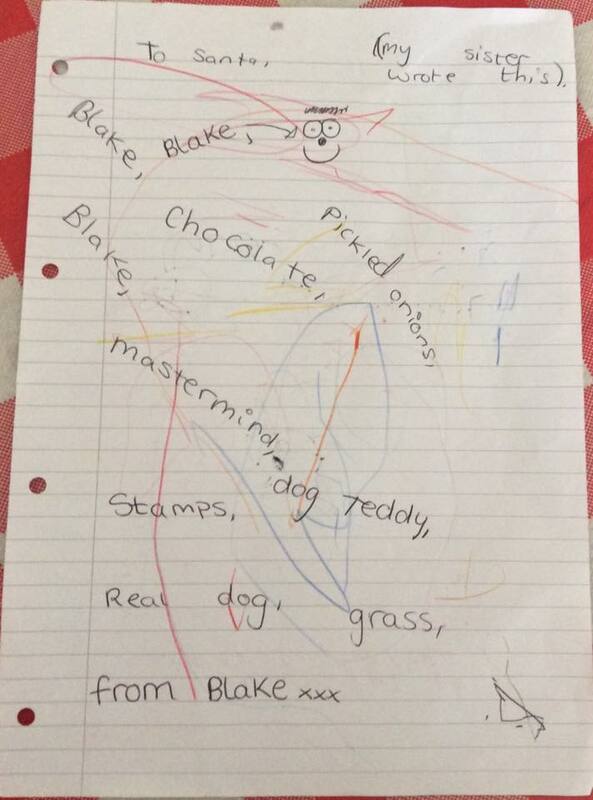 Have your children written their lists yet? Do you have any request for a new puppy or some pickled onions? Have you started your Xmas shopping yet?